Synergy M100 L Shaped Shower Bath - Only £187.99! In stock now for just £187.99 including VAT! Hurry while stocks last! The Synergy M100 Shower-Bath offers an eye-catching angular design with clean, bold lines, making it an ideal addition to any modern home. This bath is known for its excellent heat retention, highly durable and strong design, and for having an excellent water-holding capacity. 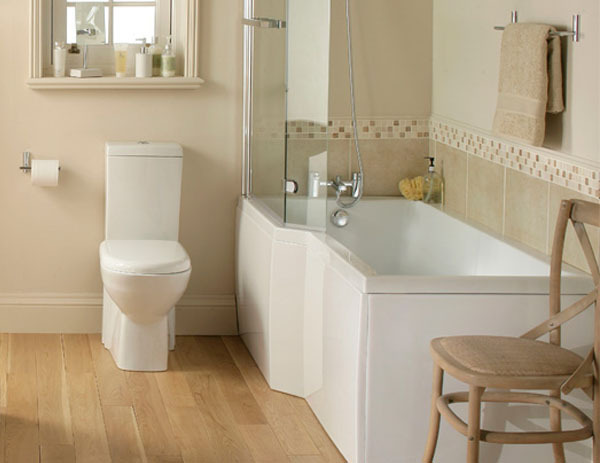 Combining fantastic value for money with a superior build quality, the M100 is a great choice for any bathroom. This is ideal for a nice, long and luxurious soak after a hard day's work. 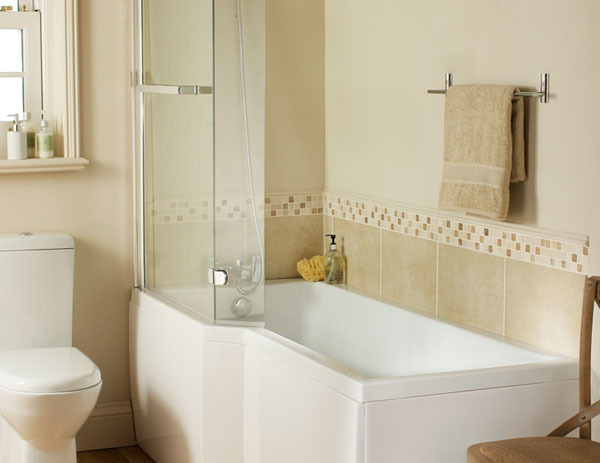 The Synergy M100 L Shaped Bath Is Renowned For Strength, Comfort And Value. The highly popular M100 L Shaped Bath has earned a lot of praise from our customers for its outstanding mix of value and quality, as well as for its superb looks which make it the idea centrepiece for any bathroom. Designed to accompany any style or suite, this excellent shower bath is just as suited to busy family homes as it is to designer hotels or apartments. Built to last and ever-reliable, the M100 is known for offering maximum value for money and is highly reliable - as well as being luxuriously comfortable to bathe in, and very easy to clean. This is an L Shaped Bath, designed specifically to provide added room while relaxing in the tub, as well as to allow maximum room when showering. 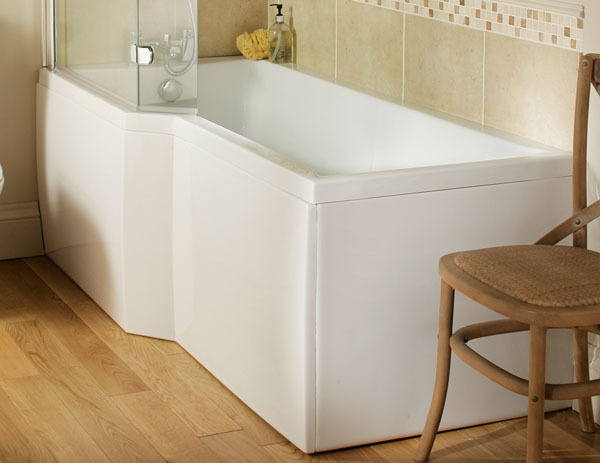 The bath features a very sturdy construction of 5mm premium grade acrylic reinforced with fibreglass, along with an integrated base-board, providing maximum strength and rigidity. All this makes it ideal for showering as well as for long, relaxing soaks. The trademark strength and durability of this shower bath are also shown in the screen, available as an option extra via the drop-down menu below. 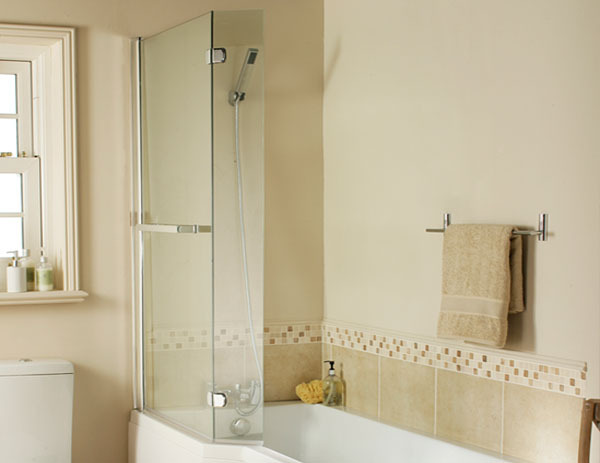 This is manufactured in 5mm toughened safety glass, complete with chrome finish and a special Infinity Seal to prevent leakage or drips. Optional Front and End Panels and / or the Shower Screen pictured are available for this bath as additional extras. (Please see the drop-down menu below). This bath is also available in a choice of two sizes, in Standard or Premier Finish (also selectable via the drop-down menu below). Left Or Right Hand Bath? Alternatively, you can view our full range of Wastes by clicking here.